Building a go kart frame is straight forward. 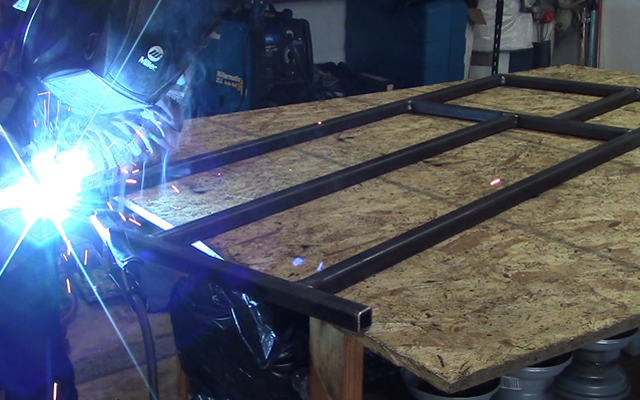 Arrange and brace the steel tubing on your workbench, tack weld the frame together, then weld everything up. 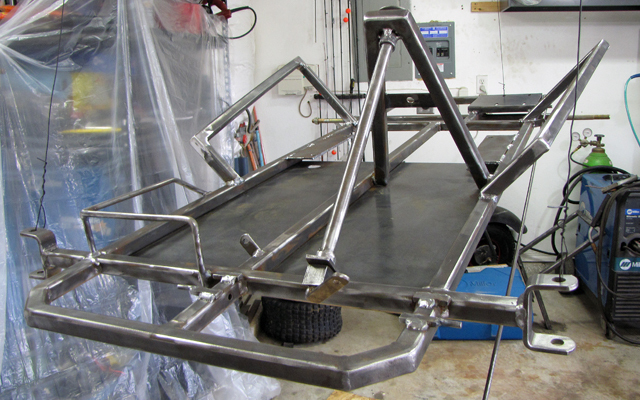 We will focus on the base frame and bumper, then move on to other components in the next page. The go kart frame plans show how to build a 2 seat go kart, step-by-step, with all of the correct gauges of steel tubing, sheet, and plate. So lets start with the base, which is made of 1″x1″x11 gauge square tubing. In order to make sure the base frame is level and square, set it up on a level work space. I used a piece of plywood (OSB) on my workbench and a square to position the frame sections, then used nails to secure the tubing. The reason why I did this is because as you weld, the tubing will warp slightly at the weld. Bracing the frame will prevent warping and keep everything square. 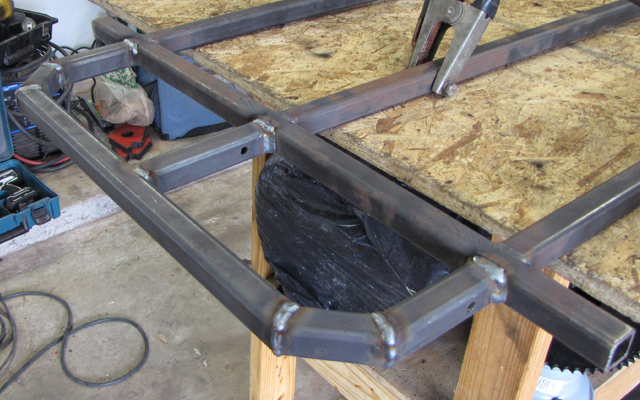 The next step is to tack weld the frame into place. Tack welding the go kart frame is easy. First, make sure the tubing matches up (notice how I used a straight edge in the above picture to make sure the tubing was on the same plane). Next, make a small tacks at the tubing intersections. I made four tacks at each tubing joint. Finally, remove the nails. 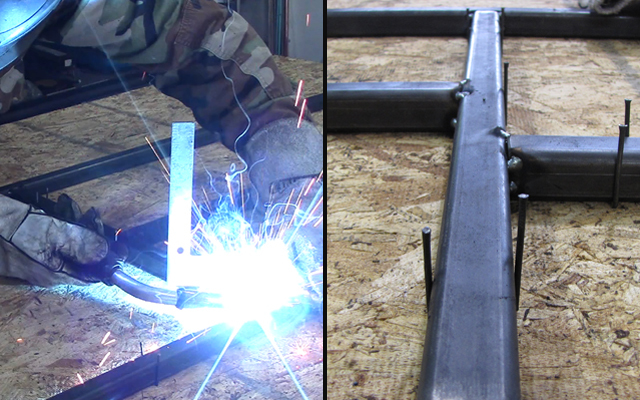 Weld one joint side, then flip the frame and weld the other side of the tubing. Double check all of your welds for the base frame, then move onto the bumper. 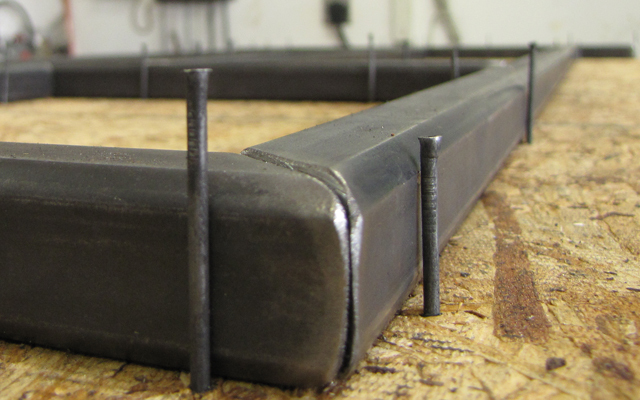 Do the same bracing, tacking, and welding as before with the bumper. Make sure you have the 5/16″ pedal holes drilled exactly in the center of the tubing 1 1/8″ from the edge of the tubing. These holes will serve as the pivot point for the brake and throttle pedals. I do not advise grinding any welds down on the main part of the frame. 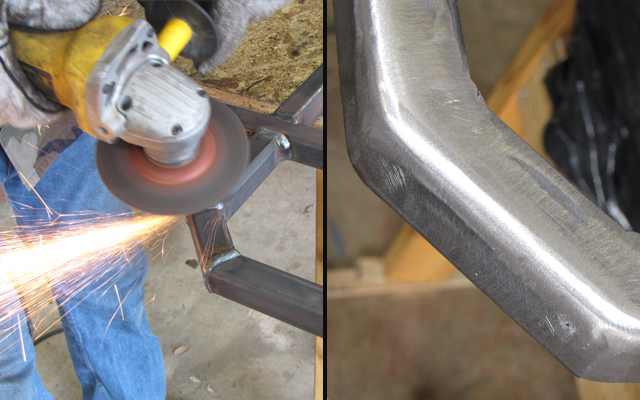 However, for aesthetic purposes, its ok to grind down the bumper welds to smooth out the edges. First, I ground down the welds with a grinding wheel on my angle grinder, then used a sanding wheel to polish and smooth out the grind marks. The end result was great! Alright, we are making some great progress now! Next up is the go kart axle. 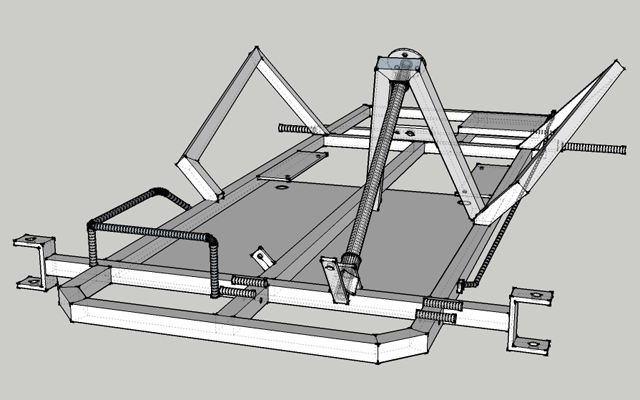 on page 12: for the supports for the motor mount the drawing shows the 14″ length of 1″ square tubing and the 14″ length of 3/16″ x 1″ flat bar. According to the drawing the 3/16″ x 1″ is 7 1/16″ away from the inside of the side tubing, and the 1″ tubing is 5 1/2″ from the other side. If you add the sections 7 1/16″ +3/16″(flat bar)+ 1″(square tubing)+ 5 1/2″ you come up with 1′ 16″ 15/16″ which is 1/16″ short of the 1′ 7″ which is the opening. Also the next picture which shows the engine mount sitting on its supports, It shows that the engine mount is 17 1/2″ away from the outside of the main frame 1″ tubing. This will place the mount so it just misses the 1″ support tubing. Can you please clarify these two issues? please refer to the plans again, you are reading them wrong. 1’4″ is not 14″, it is 1 foot and 4 inches. Keep in mind that the drawing is made to scale, and it is accurate. It does not add up the width of the flat bar and tubing, just how far the edge of it should be from the frame, which is why it doesn’t add up to what you are trying to say. Also please use your best judgement when welding on the motor mount. This should be one of the last steps after the live axle is installed so you get the clutch and engine centered. The flat bar on the PTO side of the engine is supposed to sit under the motor mount to give you enough room for sprocket and chain clearance. Depending on what you ordered, the motor mount could be slightly different than the one that I used in the plans. The goal here is to get the motor centered on the frame and that the clutch and sprocket and chain clear the frame. Will the 16hp vanguard engine with a 40 series torque converter and the Comet FNR gear box all fit in the Go-kart fit frame XL? To make a 4 seat go kart, would using the same steel frame size ok or should a thicker or bigger size be required? And would the same desing just longer back from ok or a different desing would be required? a 4 seat would need to be wider and you would need to make it longer. You would have to have a better steering geometry after making it wider and longer to be able to turn. I was wondering if a person wanted to make the frame 64″ long instead of 58″ in total length would this then affect the steering geometry? Do you believe that it would work to mount the steering column in the middle of cart instead of the left side so that one could make this a single seat kart? Thank you. How much does the metal and parts cost together I have all the tools and and some scrap metal? What is a dead axel and a live axel. Looks great.You make the assembly of the go cart frame look really easy.What kind of welder are you using Mig,Tig,etc??? and where do you get the steel.??? I would like to try this some time but I have two left thumbs?? mig, you get steel by googleing “steel distributors near me” Anybody can do it if they practice a bit beforehand. Where can I buy that frame already built ? You can’t. These are instructions and plans to MAKE your own. as iam new to this i want to make a chasssis of a go kart by me itself ……but iam not able to understand how to start……i want to design a chassis of my self …..so ls guide me how to start to make my own chassis..
Can someone help me maybe send me a different diagram? As in you don’t know how to reach feet and inches? 1’3″ is 1 foot, 3 inches. I want to know that will an electric stick welder be okay to weld the steel frame… Also can u please let me know the dimensions of the tubing required in steering and other parts. Yes, a stick welder will work. If you want to know all the dimensions and stuff, you would need to read the actual plans. If you click on the go kart parts kit at the top of the page, you can select some of the parts instead of all together. You can get a predator 212 for $100 – $150 and it should work great, you can mod it for about $70 and get nearly twice the power. Can’t find 1″ 11ga (3 millimeter) thickness at my steel shop. Is 2.5 millimeter will be enough? When cutting the bumber, the plans say for 22.5 degree on chop saw or 67.5 on a protractor…my chop saw is measured by 5’s, however I do have a digital angle finder…could you tell me the angle I would be looking for when using that? Can u tell me the complete step by step procedure of making go kart racing car for college project purpose. I’m a bit confused and don’t know from where to start. Himanshu, please understand that college is much different than school was up until this point in your life. You will need to work hard, and figure things out on your own. I wish you luck, and please give all the effort you can into making it work, because nobody is going to give you a complete step by step guide for building a race kart, as it is impractical for anyone to do that. Race karts are precision built by reputable kart manufacturers and making a diy race kart is no small feat. Again, good luck and put hard work into your project and you will reap the rewards of how much effort you put into it. I don’t build go karts for people. on the main page http://kartfab.com/go-kart-plans just scroll down to the picture of the kit and click on it. Go to a local steel manufacture and order the steel in the dimensions needed. They might already have done in those dimensions but if they don’t they will charge you extra because it’s a custom order. so you can turn the go kart off in an emergency, its called a kill switch and is essential for safety. If your throttle sticks or your brakes fail or anything else, that is there for you to access easily to turn off the engine. To make drive wheel turn faster for moer speed how many tooth clutch sprocket and drive sprocket would you recommend for #35 chain. What welder did you use? Yes, if you know how to weld with an arc welder you will be fine, I’m going to use a stick welder.